If you're in business at all you know how important it is to keep a consistent brand image. Your brand image is what people will recognize you by, how you become distinguishable in this insanely huge industry, it's who you are and how you communicate your message, and let's face it - it's a pretty big deal. For those of you who aren't in business, branding is huge. Think of McDonald's or Nike. You can immediately distinguish their colors, logo, slogans, etc. Everything that makes up McDonald's, Nike, Forever21 , any big or small name is branding. Another big name in the productivity world is @Misstrenchcoat . She is immediately recognizable by her black and white stripe pattern, turquoise accents, and glasses. You all might know me by the pink and gold theme, the gold glitter lettering, or my immense obsession with coffee and flowers. 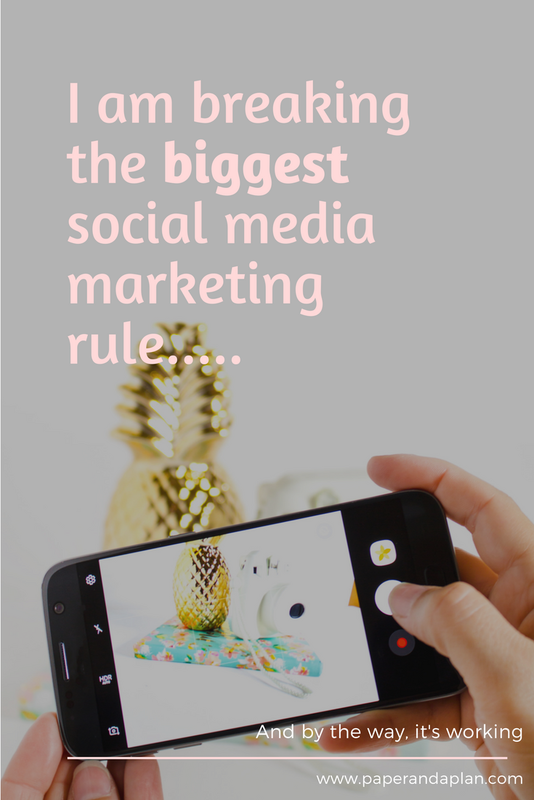 However one of the biggest unspoken rules of marketing is to keep a consistent profile image to become easily recognizable across platforms. An even BIGGER unspoken rule is that your profile picture should show your face making direct eye contact. I myself learned this from Jenna Kutcher's most recent webinar & instagram challenge. So for a few weeks I had a somewhat staged photo of me at my desk which seemed fitting to my brand. However it looked totally fake. Having your face and making eye contact in your picture is suppose to establish some kind of trust. It's suppose to be warm and inviting. When you see my face you're suppose to be more likely to follow me or something. Which I believe. However I also believe this: I am not every other brand. Call me stubborn, say what you want, but I really do believe there has to be something to set me apart. I know for a fact I'm not the first person or the last person to break this rule, but I'm doing it. I strongly believe my "brand profile picture" should change as I do. I am the face of my brand after all. (Or in the most recent case, not my face). This is the picture I am currently using as my Instagram profile image. Not too bad right ?? It's still me. So why is this such a big deal? So many people preach this full face, professional, smiling, staged look. It makes it more "official". What always confused me is why I can't be authentic ? Why I should have to be a robot and follow the crowed ? By no means am I knocking everyone who decides to do a full blown professional picture, because I'll probably some day have my own. I'll just never understand how this standard came to be. I like having some mystery behind my profile picture ! I honestly think that my profile picture shouldn't be the determining factor of someone following me or not, or deeming how professional I am based on the photo quality. Those things should be determined through my content. I show my face plenty of other places ! In my Instagram feed, on my stories, on my YouTube channel, on my about me page on my blog , and more. Just because my face isn't the first picture you see doesn't mean that it's not there. Do you have any thoughts or comments ? Do you think more people should be breaking this rule?